Havas Worldwide London advertising agency commissioned a drawing for the new Citroen Cactus car. The drawing was commissioned for a press ad campaign, the ad was printed in well know car magazine such as BBC Top Gear magazine, which has a large reader base and is very popular. The concept and briefing for the new Citroen Cactus car were to illustrate the car as a dod to dot line drawing. The dot to dot drawing had to be detailed enough to be able to see the critical features of the Citroen Cactus car. the outstanding features of the car which would be drawn and visible for the press ad we the front end of the car, the front wall and the rear lights, the rest were drawn as dots for the dot to dot illustration. 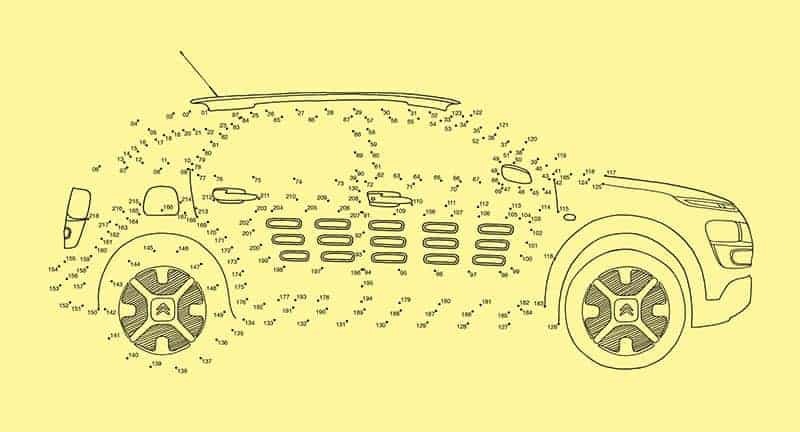 The difficult and complex execution of the illustration was to make sure anyone who wanted to try and complete the dot to dot illustration of the Citroen Cactus was able to do so and complete the car. I figured out with a little bit of trial and error the placements of the dots so that they could be easily followed by anyone who tried. Overall the objective of the brief was to first convey the shape of the car, and the second being a working dot to dot line drawing illustration.